This marker consists of a simple stone slab, approximately two feet in height. A short inscription memorializes the location of an inn the George Washington visited in 1791 while on his tour of the southern states. This marker was erected in 1930 by the Daughters of the American Revolution. In the spring of 1791, President George Washington began his tour of the southern states. Washington decided even before his inauguration to visit every state in the nation in order to gain a better understanding of the condition of the country and the needs of the people. His cross-country journey began in 1789 but, because North Carolina did not ratify the United States Constitution until 1790, his trip to the south was delayed. Between March and June of 1791, Washington traveled along the eastern seaboard from Maryland to Georgia, and then took a western return route from Georgia to Virginia. During his 1,700-mile tour he sought to emphasize national unity, understand the region's political sentiments, and learn about the southern economy. North Carolina was of particular importance to the tour because of its late ratification and Washington used his stops in the state as an opportunity to reinforce its admittance into the union. Washington was revered as the father of the nation and, because of his status, his visits to communities across the country were of important historical significance. 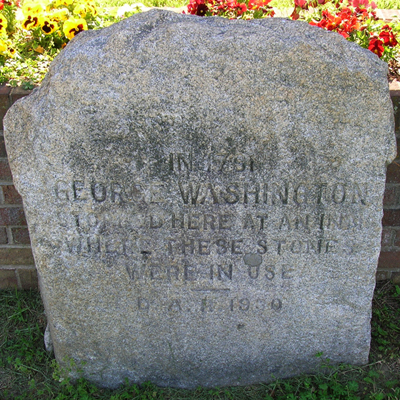 There are several stone markers across North Carolina that commemorate President Washington's tour of the southern states in 1791. Notable among them are George Washington Tree Marker in Hampstead outside Wilmington, George Washington and Henry Clay Marker in Wilmington, George Washington Boulder in Lexington, commemorative plaque in Tarboro, "George Washington Visit in Greenville, and a stone marker at Guilford Courthouse. The marker is located at the intersection of Washington Drive and North Carolina Highway 150. When traveling south on North Carolina Highway 150, the marker can be seen on the right side of the road. The marker sits in from of the "Washington Estates" residential neighborhood sign. It is positioned in a grassy area approximately fifteen feet away from the road.